The jumbo-bodied F-55 (formerly F-50R) produces an extraordinary amount of volume and warmth, matching a tight-grained solid Sitka spruce top with solid Indian rosewood back and sides for extraordinary separation and clarity. Its strong, focused bass response, sweet, singing mids and crisp highs give it a distinctive voice that sets this guitar apart from all others. Elegant cosmetic appointments include the classic Guild “V-block” inlays, gold Gotoh hardware and a beautiful nitrocellulose lacquer finish. Exceptional build quality and premium specifications make it a worthy heir to the historic Guild jumbo legacy. The Antique Burst finish gives it even more charm and character. 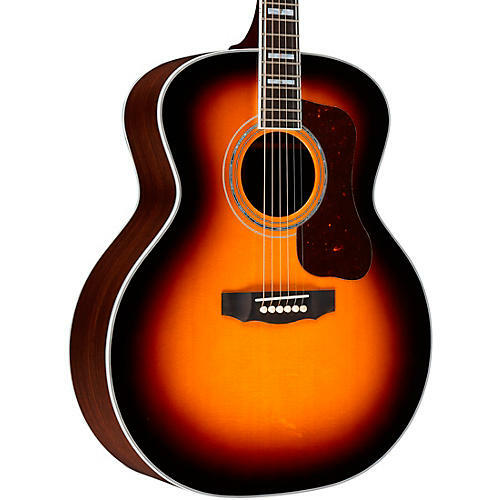 Guild's F-55 ATB comes with a premium humidified hardshell case to keep your guitar in peak condition longer.